For each template, you can configure a horizontal and vertical offset. The offset is applied to every design that uses the template, and shifts the design’s components by an amount given by the offset. The offset is created with a special component named Child Template Content. This component is available only via the Sidebar and Editor canvas when editing the template, and is not available in the Component Palette. By default, the offset is not enabled. When enabled, the offset is identified by a small background image. 1. Open the template of interest. Open the template via the Library, or when editing a design that uses the template. Click the Sidebar button in the Editor toolbar, or use the keyboard shortcut. 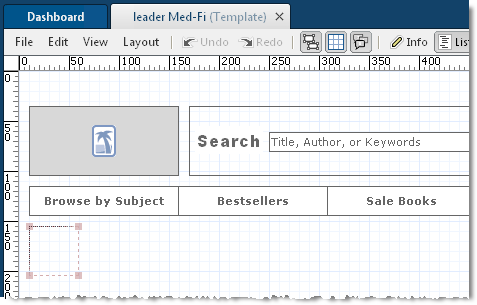 The Child Template Content is located at the top of the Components Outline pane. By default, the offset component is locked. To unlock it, select it in the Sidebar and click Unlock Position from the right-click context menu. Position the offset in the Editor canvas. This position will define the horizontal and vertical offset that’s applied to designs in which the template is used. The template offset is shown below. Its default position has been changed to define an appropriate offset for this template.